Behind Mount Rushmore there is a titanium vault called "The Hall of Records"
The list of sculptural landmarks in the United States is quite long, but only a few of them have become emblems of their environments and symbols of the entire country. Such is the case with the Statue of Liberty in Upper New York Bay. Over the years, the robed woman, representing the Roman goddess Libertas, grew to be much more than just a symbol of the great friendship between the people of France and the United States but it also became the world’s greatest symbol of liberty and one of the most famous sculptural landmarks in the world. There are numerous other important memorials and monuments such as the statue of Abraham Lincoln inside the Lincoln Memorial, the Washington Monument, the Liberty Bell, St. Louis’ Gateway Arch etc. However, when it comes to becoming an emblem of a particular environment and a symbol of the entire nation none of them can match the imposing Mount Rushmore. Rising proudly above the Black Hills of South Dakota, Mount Rushmore is an unforgettable sight and a true “Shrine of Democracy.” With over 3 million visitors every year, both from the United States and all over the world, this famous monument is one of the most prominent tourist attractions of the country. 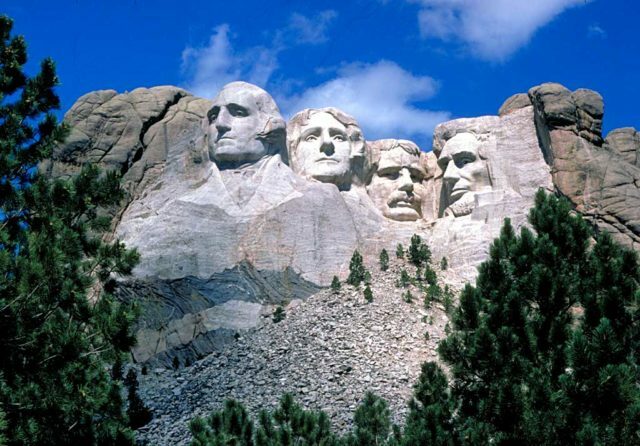 The granite remains from the construction of Mount Rushmore are still visible below the heads of the Presidents. Historian Doane Robinson is the man who came up with the idea for the monument with the goal to attract more tourists to the state, but it was the famed sculptor Gutzon Borglum who turned Robinson’s idea into reality and carved the masterpiece we are all proud of today. 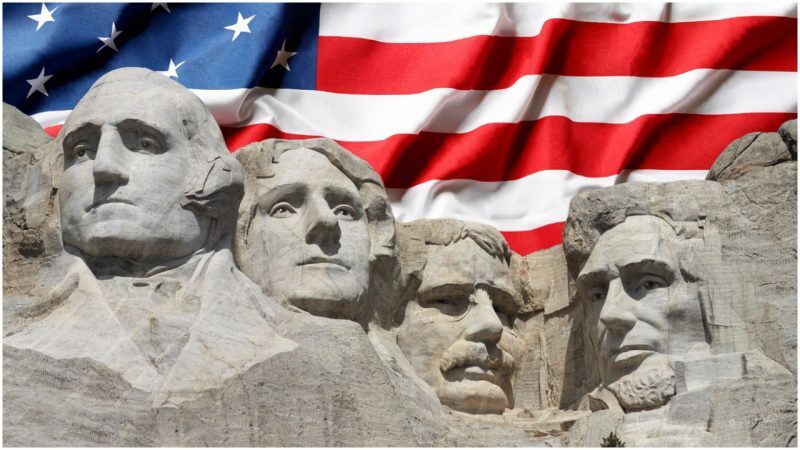 The massive sculpture depicts the faces of four United States presidents who profoundly shaped the history of the country and became an integral part of the fight for freedom and democracy. 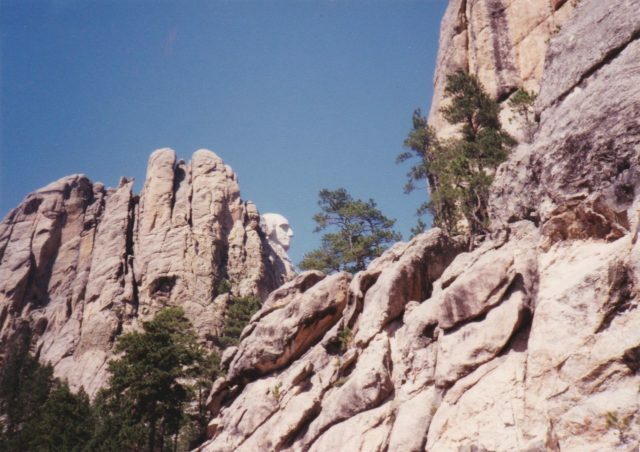 The faces Borglum carved into the side of the mountain are those of George Washington, Thomas Jefferson, Abraham Lincoln and Theodore Roosevelt. 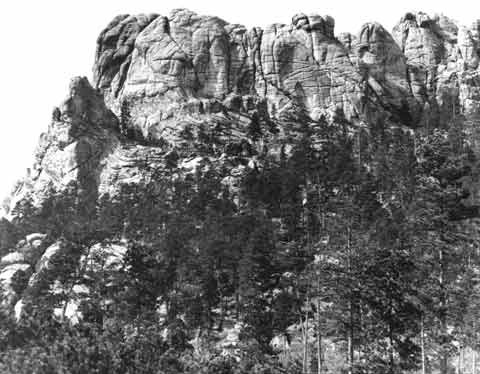 Mount Rushmore before construction, circa 1905. Borglum began carving in 1927 and worked on the ambitious project until his death on March 6, 1941. 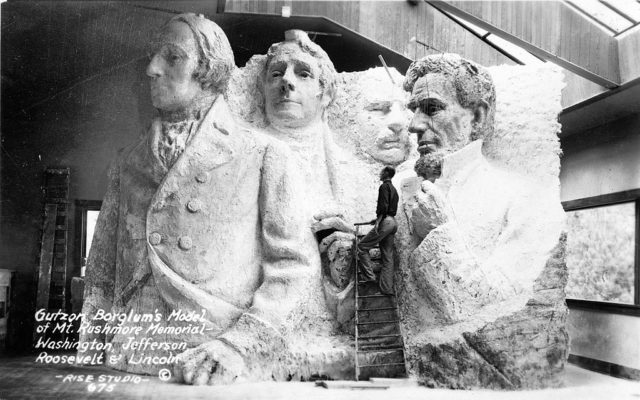 His original idea was the sculpture to depict the presidents to the waist but his death and the American involvement in World War II both contributed to the final result and about eight months after Borglum died, Mount Rushmore National Memorial was declared completed. Nonetheless, the original vision Borglum had in his mind was much more complicated than just the heads of the presidents we can see today and it included massive descriptions of some of the greatest events of the American history from 1776 to 1906 and inscription of the Louisiana Purchase. His plan seemed pretty ambitious, but the biggest problem was that no one would be able to read the text of the inscription from a great distance and additionally, it required relocating Jefferson’s head. When it became apparent that his plan wasn’t going to work out, he came up with a new one which included the creation of a Hall of Records. The large room within the mountain was supposed to tell the story of the United States to future civilizations as Borglum believed that someday Mount Rushmore would be as mysterious to future civilizations as Stonehenge is for us today. His idea was approved by the government but they required that he first finishes the heads of the presidents before he could start working on the secret chamber. However, he never lived to see the project come to life, as he died in 1941, at the age of 73. It took nearly 60 years before officials finally revived his last dream by installing a titanium vault in the granite floor of the chamber where they placed the history of the United States, the Declaration of Independence, the Constitution, the Bill of Rights, and Borglum’s biography. Just as the sculptor imagined, the idea behind the titanium vault is to be found and opened by future civilizations so they could learn about us. Sadly, not many people had the chance to see the Hall Of Records as it is not secure and accessing to it is too dangerous to be permitted for tourists.